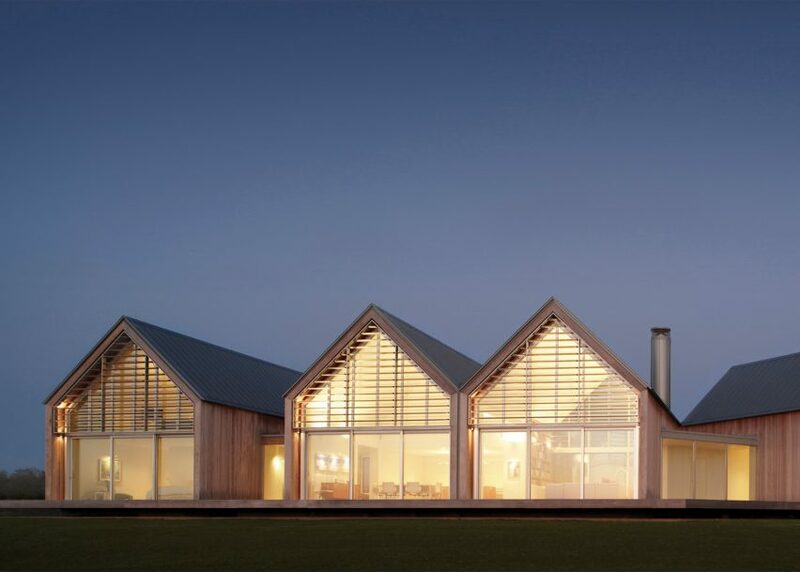 This holiday home in Rhode Island by US studio Roger Ferris + Partners consists of a cluster of gable-roofed volumes, influenced by vernacular architecture in rural New England (+ slideshow). 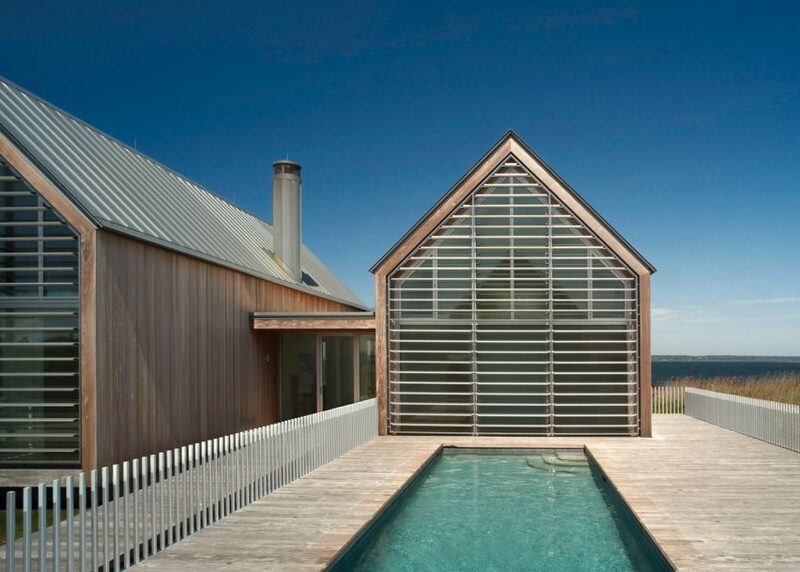 The Ocean House is located on a coastal site in the quaint town of Little Compton. Totalling 5,500 square feet (511 square meters), the residence consists of five distinct volumes connected by a raised deck. 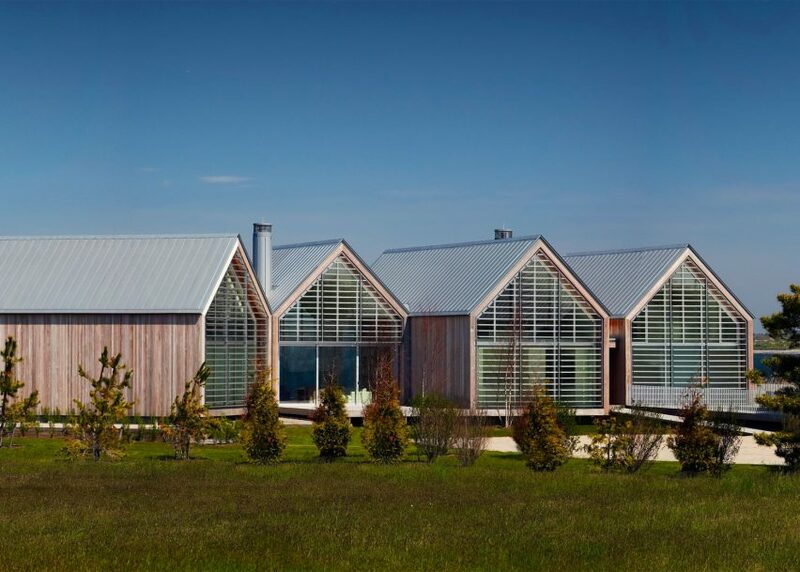 Topped with gabled roofs, the structures are meant to evoke traditional barns and boat sheds found in the region. 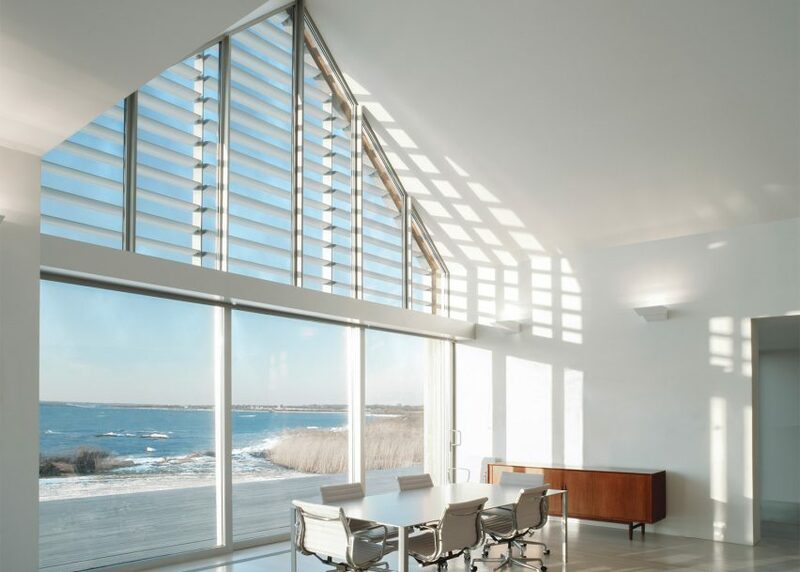 "Ocean House responds to the demands of the historic commission for conformity while striking a modern tone," said Roger Ferris + Partners, a studio with offices in Connecticut and New York. Wetland constraints limited the usable site area and influenced the layout and orientation of the volumes. The home comprises a master suite, guest sleeping quarters, a spacious living room, and an open-plan kitchen and dining area. "Master bedroom and guest bedroom 'sheds' are separated from one another for greater privacy and quiet," the architect noted. Visitors access the dwelling via a 40-foot-long (12-metre) wooden ramp, which leads to a sheltered entrance. 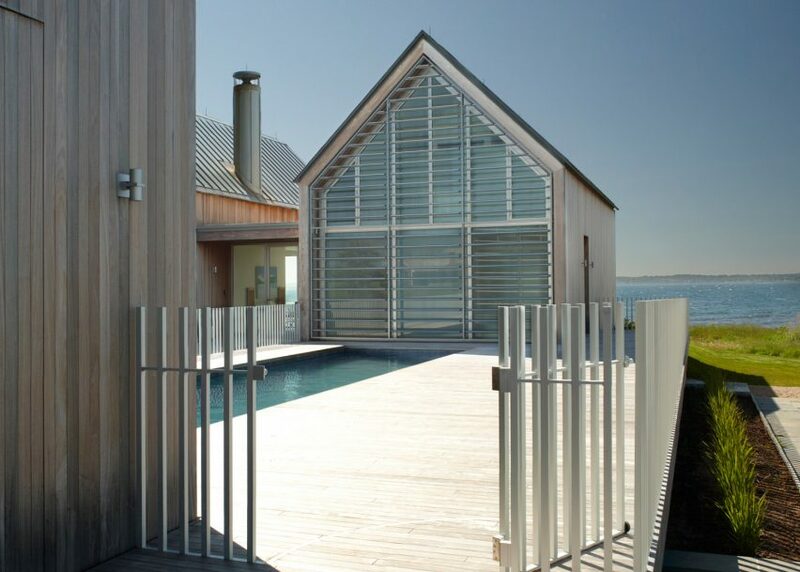 To the right of the entrance is a skinny lap pool, which is "located on the leeward side of the house for protection from winds", explained the architects. 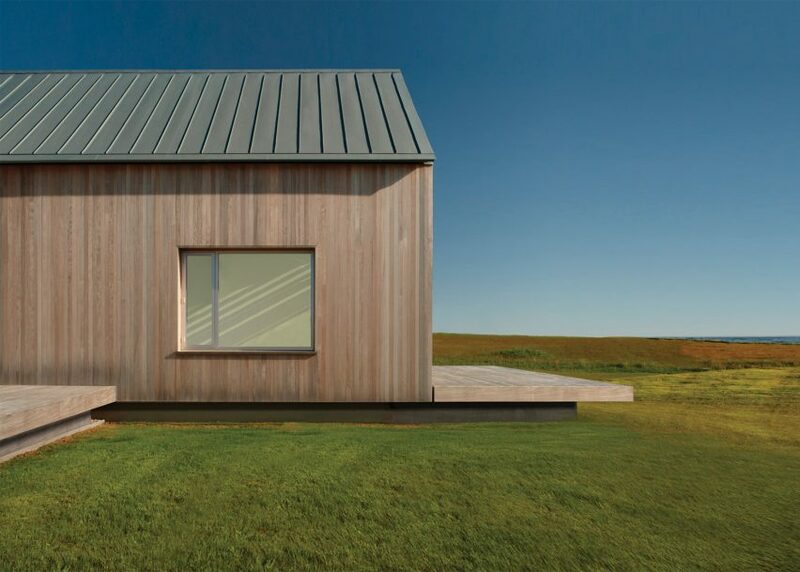 Exterior walls are clad in weathered ipe – a dense hardwood known for its durability – while the roofs and chimneys are sheathed in zinc panels. 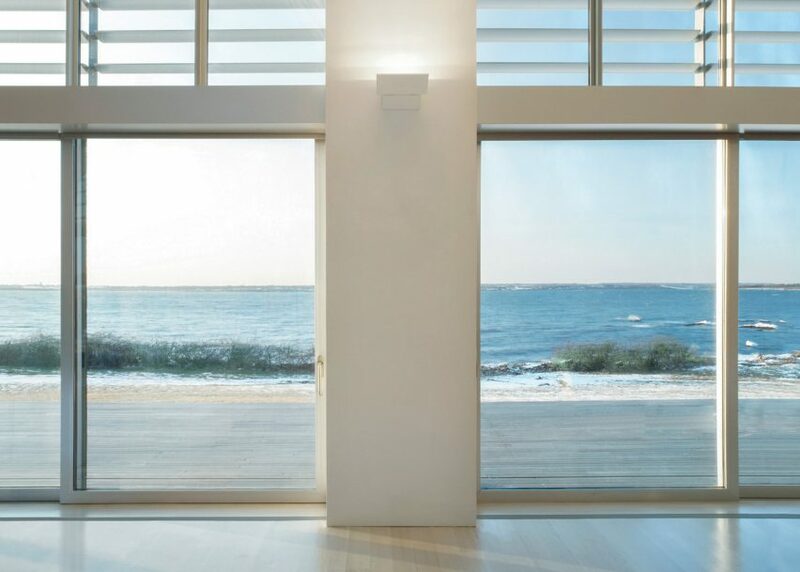 On the west elevation, full-height glass walls offer sweeping views of the sea while also providing privacy. 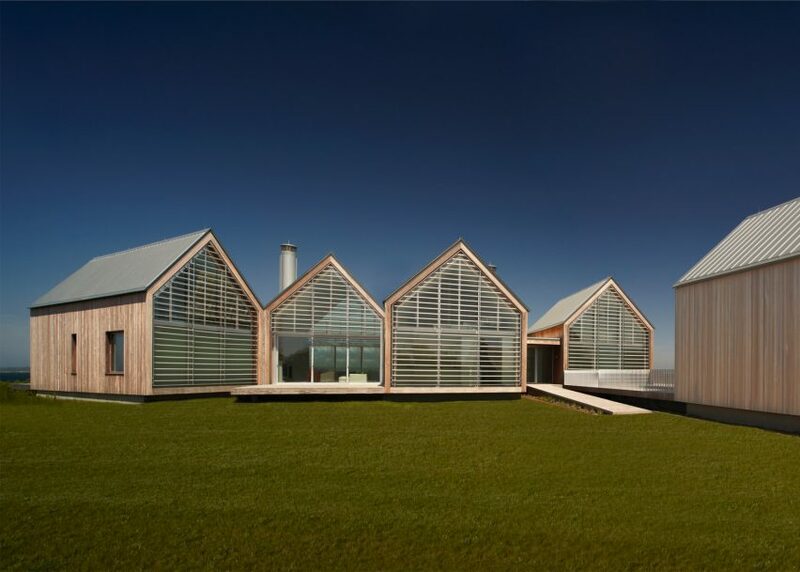 "The glazed faces offer an expansive view toward Easton Bay and Sachuest Point National Wildlife Refuge in the distance," said the architects. 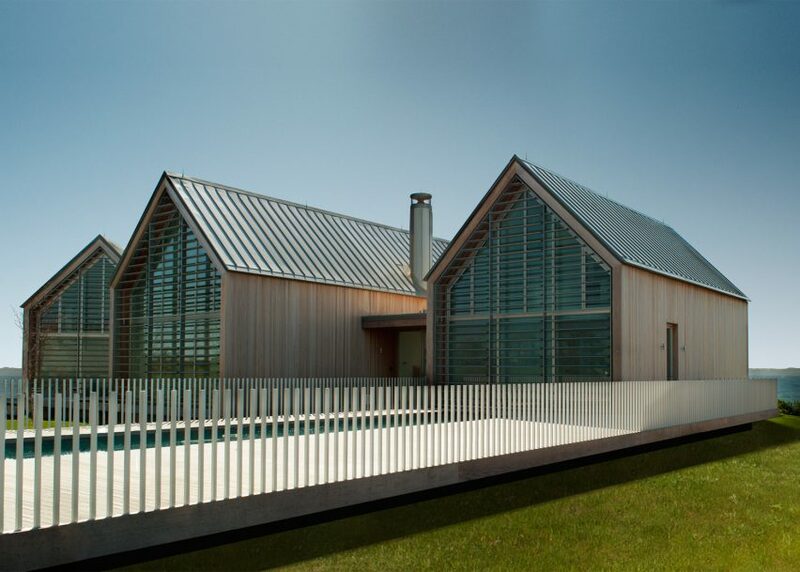 To help reduce solar gain, the architect covered the glazing with horizontal aluminium louvres, in addition to installing motorised window shades. 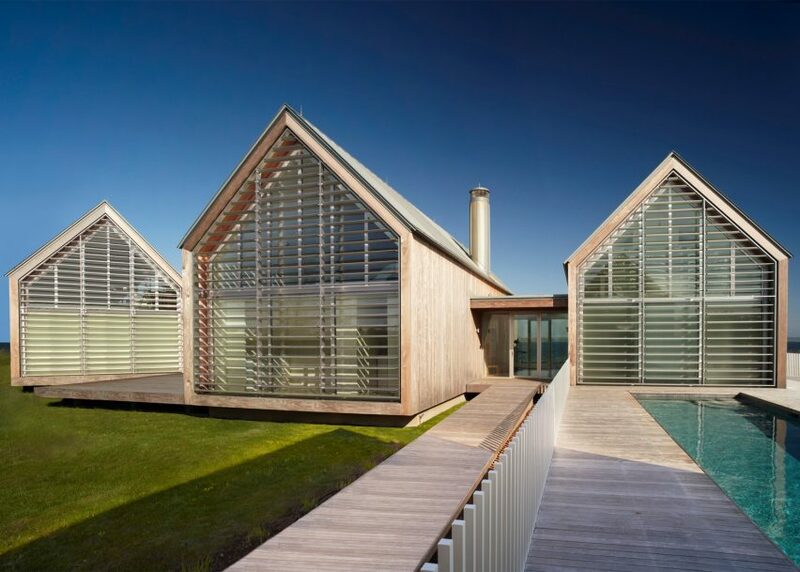 Deep roof overhangs on the east and west provide further protection from the sun. In the evening, the home emits a warm glow due to illumination from within. The sparsely furnished interior features white walls and light-shaded wood, including bleached white oak flooring. "The interior living space is seamlessly extended outward via the continuous raised deck – the principal outdoor living space," the architects said. The project has a number of sustainable elements, including a rainwater collection and recycling system, a permeable driveway made of crushed shells and a landscape design with native grasses. 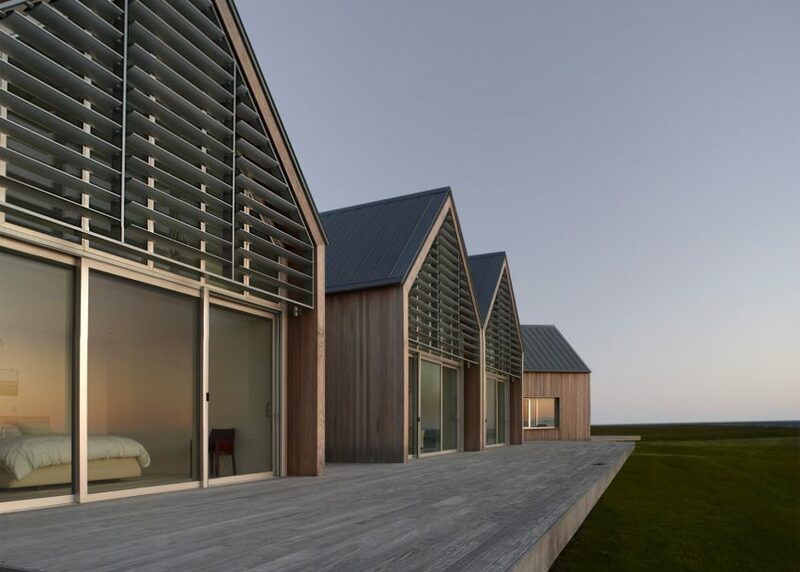 Other American homes include a weekend retreat in Rhode Island clad in cedar and slate and a "moveable" vacation home on Martha's Vineyard that consists of eight concrete volumes. Photography is by Michael Biondo.